Our No-Climb fencing options provide privacy and security, along with rich visual texture. Three horizontal eucalyptus fence droppers are woven with vertical eucalyptus saplings to create a tightly packed wall of ‘eucy’. The narrow saplings provide very little toe-hold, meaning fences are very difficult to climb; although, the uniform, flat guadua molding in our bamboo version of this fence (see related products below), do provide more privacy. Appearance: Natural light brown/tan of the treated eucalyptus. Lots of vertical light and shadow. Perfect for a backdrop to a garden. Grade (Int. vs. Ext. ): Perfectly suitable for both interior and exterior applications – used nearly exclusively outdoors, however. Fire Protection: Not typically needed in fencing, but Safari can provide eucalyptus poles that have been treated to a full class-A. Check with your Safari Sales Rep for more information. Durability: Eucalyptus is our longest lasting fencing material. 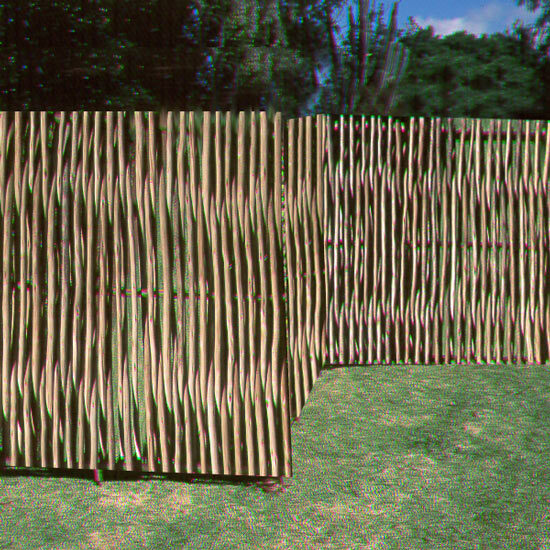 Materials: Eucalyptus saplings “Ntengus” and fence droppers.